With the end of World War II in August 1945, there was still no consensus on Korea’s fate among Allied leaders. Many Koreans on the peninsula wanted independence and rejected re-occupation by foreign forces. Per the agreement at Yalta, the USSR entered the fight against Japan and invaded Manchuria and northern Korea. On August 10, 1945 two young officers, including future Secretary of State Dean Rusk, worked to define an American occupation zone. 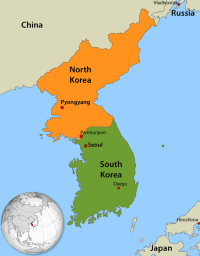 Working on extremely short notice and without consulting any experts on Korea, they used a National Geographic map to decide on the 38th parallel (not knowing that 40 years earlier, Japan and Russia had discussed sharing Korea along the same parallel.) 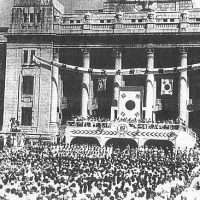 On August 15, 1945, Japan’s last Governor-General handed over power, marking Korea’s Victory over Japan (Gwangbokjeol, literally “Restoration of Light Day”). The Republic of Korea was established exactly three years later. 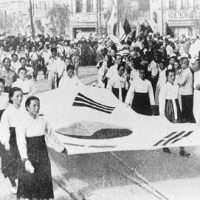 Despite Soviet opposition, a UN-supervised election helped establish two separate Korean governments, with the South Korean government declaring independence from the U.S. military and the USSR’s Korea building up military strength. David E. Mark was the Political Advisor (POLAD) to U.S. Forces in Seoul from 1946 to 1949. He discusses the failed attempts to create a unified government for Korea, the reluctant appeal to the right wing for support, and the American Secretary of State’s initial declaration that the Korean peninsula would not be inside the U.S. security perimeter. He was interviewed by Henry Precht in July 1989. You can read other stories about the Korean peninsula here. We were installed in what had been the Consul General’s house. Seoul had been one of the consulates general under Tokyo before the war, and we had a nice compound in the center of the city with a lovely old-style house that I believe is still used by the American ambassador, plus a little office down near the gate to the compound…. But in 1946 we were the only diplomatic establishment — just the two of us. The head of the office did high politics and told me about them. I began to learn. I was engaged in everything else, which included a little bit of administration, such as it was. We had one very faithful, loyal Korean employee, who had held out even during the war under a lot of pressure by the Japanese. There was a good bit of consular work from people trying to emigrate to the United States — in those days under the Oriental Exclusion Act. No Koreans could hope to go as immigrants, but there were a lot of White Russians and others in Korea at the time…. The State Department and my boss, Bill Langdon, were really trying to prevent a right-wing victory among the Korean groups as we moved toward independence, which occurred in August 1948. The military’s first interest, as I said, was the Soviet Union and their forces, and second was our efforts to create a unified government for Korea, North and South. I think it was the December 1945 meeting of the British, French, American, and Soviet foreign ministers that had laid down a plan for a joint commission on Korea. The joint commission, American and Soviet, was to meet either in Seoul or Pusan, or both, to try to work out a unified government for the country under some form of very tenuous, unspecified trusteeship that was to be operated by the two superpowers. The trusteeship was to cover the whole country, because it was to be a unified regime. The problems of convening the joint commission were fairly serious, but that actually happened in 1946 at some point. In any event, the problem was that, in order to form a united Korean regime, we had to consult with various Korean groups. The Soviets immediately laid down a condition that consultation should only take place with those Korean groups which supported the Allied plan, including the indefinite trusteeship of Korea…. Well, in any case, the thing broke down because all of the South Korean groups — virtually all of the South Korean groups, particularly those on the right, and therefore favored by the Americans — were against trusteeship. They said, “We want to become an independent country, and we don’t want to have the United States and the Soviet Union telling us what to do after we become independent.” And the Soviets, as I said, indicated that you couldn’t deal with such people, because they weren’t accepting the plan laid out by the Allies. So the thing broke down. Nevertheless, the American-Soviet negotiations continued to try to get the thing started again. And, I think early in 1947, they agreed on a new formula that was going to get around this difficulty…. The next meeting of the Soviets and the Americans in the joint commission, in the spring of 1947, these groups began testifying before the joint commission as to what their aspirations were for Korea and how they hoped a government would be set up. But the Soviets immediately began challenging them again saying, “Well, deep down in your hearts you are still against the trusteeship agreement.” And, although we tried to work out modifications of the formula, the thing definitively broke down at that point. Of course, the Soviets had been developing the North along their lines very assiduously from the beginning, and they even set up a provisional government there in February 1946. When we arrived in Korea in September 1945, the Japanese were still there and had been there for three or four weeks after the surrender of Japan. The Koreans, in the meantime, or some Koreans, had begun to form groups of one sort or another to fill the political vacuum…. There were communist or left-wing groups in South Korea until the Communist Party itself was outlawed sometime in late 1946 or 1947 because they engaged in a lot of trade union activity and incited a large number of strikes, including even a general strike in the country. So we — the military government — just outlawed the Communist Party. In the meantime, our forces had set up a full-fledged military government along the lines of the Japanese structure. That made even our right-wing friends in the government, in effect, only political parties. 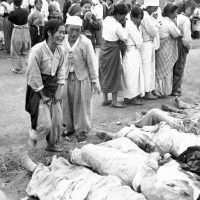 But since our military government had to rely on Koreans to staff the basic functions of the government all over the country, we tended to turn to these right-wing groups, and many of them were people who had flirted with the Japanese in one way or the other, or at least sympathized with them. We didn’t actually employ at that time people who had been Japanese police officers, although they were Korean ethnic groups. But, nevertheless, we got further and further off to the right side, and, of course, we brought back from China…Syngman Rhee, who became the first president of South Korea later on. But he was a man who had an impeccable anti-Japanese record from about 1919, when he had a little revolt against them and then he had had to flee, but his leanings were all on the right side. When he came back to the country, he was welcomed literally with a red carpet at the airport by the American generals. That gave a signal very clearly that this was a guy we wanted to support. The State Department was rather disturbed at the U.S. military’s partiality toward the rightist side, although I suspect that the American military in its own mind probably didn’t consider itself partial to anybody. They just wanted to keep the place orderly initially until they got a united Korean government, and after that until we got some sort of independent government for South Korea. They supported the groups that would make the least trouble for the U.S. Army. They didn’t want any communists there for sure. The State Department, and particularly my boss, was trying to promote a middle-of-the-road group. I remember that we served cornbread muffins for lunch, which was very important because Korea was short of food at that time, and instead of handing out rice, which is what they wanted, we handed out corn. The left accused us of feeding animal fodder to the Korean people; we wanted to show them that, indeed, we ate it ourselves, so we had cornmeal muffins very prominently on the menu. There was no sense of regional identity at the time. There’s precious little of it right now, in spite of the Japanese kind of economic hegemony, but there’s still no kind of political identity to the region, and there certainly was not even an awareness of who the players were back then when we promoted these people into the group. When the second round of the U.S.-USSR joint commission failed in the summer of 1947, it was clear that Washington wanted to get some indigenous authority established in our part of Korea. So we then began moving toward legitimizing elections that could be held in the South to create a South Korean government. Indeed, we even got a U.N. resolution passed. The idea of going to a separate government in South Korea had a little independent evolutionary history as the alternative left over when the idea of creating a joint government for the North and South collapsed. Of course, all through this period we were debating in Washington about whether we should maintain a long-term interest in Korea…. 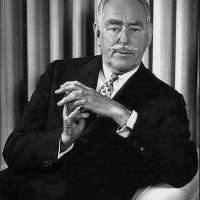 And I believe it was later in 1947 that [Secretary of State] Dean Acheson made a speech in which he clearly indicated that the mainland, including Korea — all parts of it — was not going to be in effect defended within our security perimeters. But, of course, Korea soon came to be part of our general strategy of our interest zones in the Far East. The idea of not including Korea within our security perimeter made it all the more urgent that we at least leave South Korea with some kind of independent government, independent regime. We had already had so many disappointments in Europe that were much more prominent in the minds of policy makers in Washington that the idea of a third round in Korea seemed most unpromising. Besides, the Berlin Airlift started. In other words, the blockade of Berlin started in the summer of 1947, and therefore the idea of collaborating with the Soviets became even more remote. To jump ahead a little bit, when this new government came into being on August 15, 1948, we had made the decision to pull out of Korea altogether by the end of 1948. Indeed we had reduced our forces to what they called “the reinforced regimental combat team,” which was sort of like a brigade but with different structural elements and different equipment elements. We were going to be out of the mainland militarily by December 31, 1948, but events postponed that. 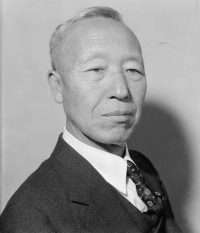 The Department considered Syngman Rhee a stubborn older man living in the glory of his 1919 revolutionary attempt, who showed no flexibility, who was inherently authoritarian, who was pretty ruthless with any opposition groups or people who wouldn’t cooperate with him, who behaved like a politician to be sure, which he had to be, but, nevertheless, one not in the democratic mold. His years of living in the West, despite acquiring an Austrian wife, had not imbued him with the ideas that we would liked to have seen implanted in South Korea, although we were probably unrealistic. After all, South Korea had been formally a part of Japan since 1910; it had really come under Japanese influence in 1905 when they defeated the Russians. The Koreans had been citizens — maybe somewhat second-class — of Japan. They had lived in an empire that was only nominally democratic even in the 1910s, 1920s, and 1930s. Japan became increasingly a militaristic dictatorship. To expect them or the Koreans to suddenly understand what democracy was all about and to embrace it was probably very unrealistic. Syngman Rhee, at least having been exposed to the West and to democracy, might have been about the best that you could realistically hope for, although the State Department kept trying, and it also was the policy of the military government for a while, to promote centrist options. 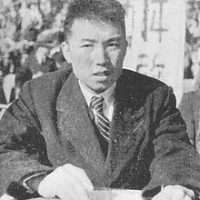 Elections did take place; Syngman Rhee was elected…and he was inaugurated as president on August 15, 1948, which was Independence Day…. The democratic center-left groups that the State Department favored faded from the scene. There was no way in which they could actively participate. The Syngman Rhee government was very tough on anyone suspected of communist leanings, and while our centrist people were clearly not in that category, they had no base, no resources, and no sort of enthusiasm on which to build. 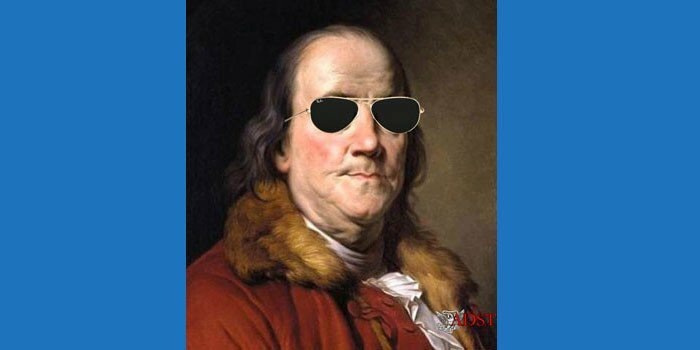 Moreover, it should be remembered that less than a year after the inauguration of the government, the North invaded the South…. A few of them disappeared during the war. I mean, they never showed up again. Whether they were killed is still not very clear. Syngman Rhee did not have substantial American help in winning the election; I don’t think he really needed it. He had gotten the signs of American approval when he was allowed to land in his own DC-4 at the airport and a red carpet was rolled out, with representatives of the American command there. He had many visits with General Hodge, who was our commander, and with the military government. I think people who were drawing conclusions saw that the Americans were friendly. I was traveling around in early October 1948, on the east coast and in the south — these were very, distant, isolated, cutoff places. We didn’t even have troops there…. I had just moved to the south just about the time the rebellion broke out. It was really a guerilla operation that had taken over large areas of the country near the spine of the mountains that run down the whole peninsula. They had not gotten into Pusan, the number two city down in the South, but they had been close by. I stayed in the South for a couple of days and then went into one of the first towns that the South Koreans had been able to recapture from the Communist rebels. It was a pretty gruesome sight in this area because the rebels had taken 200-250 people who were prominent in the South Korean government or in the community whom they had marched out of town, along a road. Then they tied their hands behind their backs and just mowed them down. I saw about 200-250 prominent dead people along the road. When our people, that is either the South Koreans or the Americans, but this was mainly a South Korean recovery operation, got hold of some of the Communist rebels, they were not dealt with kindly, either. It was pretty rough on both sides after what had happened. When I got back to Seoul about four or five days later, I went to see the Ambassador and said, “You know, the Communist strength, their military strength, is obviously a lot stronger than we had thought, and if we pull out all our forces, which is now scheduled for December 31, we are soon going to lose this place.” I was urging that we stay on and change our policy about pulling out. I mean, from my point of view, even though Japan, of course, was included in our security perimeter, it would have been much difficult to retain Japan if we had lost South Korea, and it would have been demoralizing to the Japanese really to find Soviet back forces right along the Korea Straits of which separates Korea from Japan. So the Ambassador said, “Well, draft a telegram and we will send it in.” I did that…. By this time our military was essentially not involved any longer in policy formulation; so they were never consulted on our telegram. We had already cut down two regimental combat teams, you know, and the total number of forces was somewhere probably 5,000 to 10,000 at that point. The response from Washington was that they weren’t going to change our policy, but since, obviously, conditions weren’t settled and the South Koreans needed sort of more support, at least in a morale sense, Washington would agree to let the regimental combat teams stay until July 1, 1949 — six months longer. I left in April. During my last days in Korea, I wrote a paper…ending with my views that I thought we were endangering our position in Japan by pulling out of Korea and that that our Korean policy should be reviewed in this broader context. The embassy sent the thing in from the Ambassador saying, “Here is an interesting paper from our departing acting political counselor. The embassy takes no position one way or the other.” I don’t have a copy of that paper, although a professor who is a revisionist historian at the University of Washington in Seattle, has gotten it out of the archives. He told me that he has used it to some extent in a book that he has written about the history of those years in Korea. In early 1949, we in the embassy had no sense that an invasion from the North was a real danger. We had had this one episode in October 1948, but nobody could know that this was part, or maybe a feeler, for a larger effort. In retrospect it’s easy to see why. The Cold War was heating up all over. The Berlin Airlift was going on. The Soviets were facing the problem of how to deal with our airlift. In Europe they clearly did not want to start a war over it, and ultimately passed messages in March or April 1949 indicating they wanted a face-saving way out, which came in the summer of 1949. They had lost face by it. But clearly they were thinking of other places in which they could show that they were able to conduct a cold war and indeed gain successes. Korea must have been a great temptation, particularly after we had announced our intention to pull out and had excluded it from our security perimeter, without even voicing any words of conditionality or contingency in that regard. They had built up a force in the North — an indigenous force that was much better than the one in the South and had active Soviet Red Army backing. The North is about half the population size of the South, but that wasn’t very important, because it had mobilized a large part of the population and had equipped it well. We had not done that in the South. The South was not a totalitarian state. The government was authoritarian to be sure, but there were still dissident elements in the South…. The Syngman Rhee government was totally hostile to the North. Kim Il Sung, the venerable leader who is still there, had already made his appearance. The talk in the South was, of course, that this was a usurping communist government and in the North that the ambitions of the South were very clear. But objectively speaking, the South forces were not ready and the United States was still present. I should say that the Soviet army pulled out of North Korea…in 1948, but it had…built up this very strong force which was a lot stronger than the South. I don’t remember what the Soviets may have said about their security backing for the North Korean regime. We were well aware of Soviet supplying military advisors, if not de facto commanders, down even to the company level in the North Korean forces. There was not a Chinese role at the time, because the Chinese had just concluded their own civil war in 1949, but the Soviets and Chinese were cooperating at the time. The frontier in the North was a friendly frontier for the Chinese, but they had their hands full with their own problems. When the invasion actually happened in June 1950, the American response was totally unanticipated. It shows that Harry Truman had a gut reaction that made a lot more sense than the sophisticated deliberations of the cabinet departments in the previous years. He instinctively knew that a challenge from a Soviet-backed state could undermine our entire position in the Far East and, more specifically, our position in Japan. It was becoming clear even then that Japan was going to regain its status as a very major voice in the Pacific.